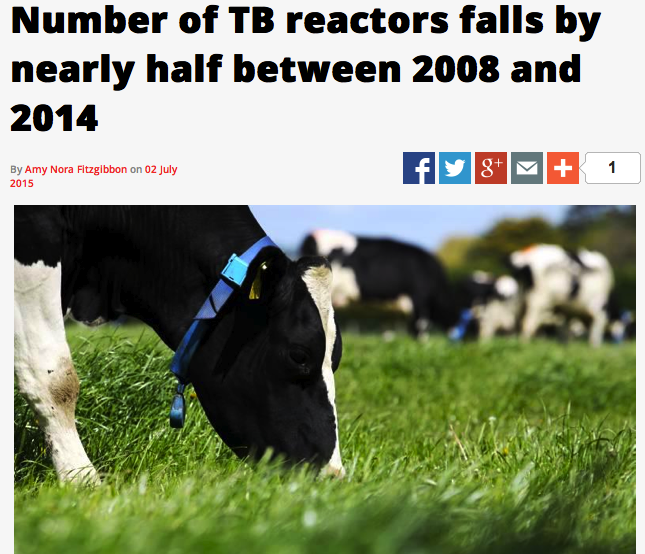 The number of TB reactors has fallen from 30,00 in 2008 to 16,000 in 2014, a reduction of almost a half in the past six years. 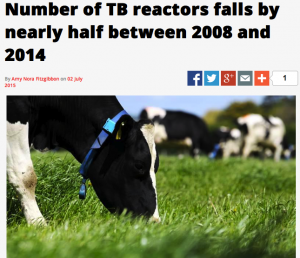 According to Minister for Agriculture Simon Coveney, the TB eradication programme has resulted in almost halving the number of reactors in Irish herds between 2008 and 2014. The decline has also continued into 2015, with the result that reactor numbers are likely to fall below 15,000 this year for the first time since the programme was introduced in the mid-1950s. In percentage terms, the Minister said that herd incidence of tuberculosis fell from 5.9% to 3.6% between 2008 and 2014, and, with the possible exception of Wicklow, has continued to decline further this year. Coveney went on to say the reduction in the incidence of the disease has brought significant benefits to farmers, with 2,700 fewer herds restricted in 2014 compared to 2008. Moreover, the annual cost of the TB eradication programme has fallen from €55 million in 2008 to €35 million in 2014. However, the areas of Wicklow, Westmeath and Wexford are three counties where incidences of TB are significantly higher than the national average of 3.6%. The Minister referred to a recent study carried out by his Department which looked at the impact of TB in deer on the situation in Co Wicklow.